Subshrubs - perennial plants. Rhizomes or roots long spindly. Stems recumbent, rose slightly or half face, (5,0-) 25.0 - 60.0 cm (-100.0) cm long, branched, spread out at the base woodened, scantily-fitting fibrous. Stipule little shorter than petiole, 8.0 - 10.0 mm in length, free or at the upper leaves fused together, elongated or triangular Lancet, green, white short fiber in the end ciliates. Leaves (3.0) 9.0 - 13.0 cm long, thin, imparipinnate, short stems. Leaflets (7) 10 - 15 (18) pairs, elliptic, lanceolate to elongated ovoid lance, 15.0 - 30.0 (35.0) mm long, 10.0 - 15.0 mm wide, rounded at the top, acute or engraved on both sides short idly fitting fibrous rarely top almost naked. Inflorescences cluster with stems, long 4.0 - 10.0 cm, equal to 1/2 or 2/3 in inflorescences leaves. Racemes 4.0 - 6.0 cm long, head-like or elongated ovoid, dense, with many flowers. Bracts 5.0 - 7.0 mm long, linear, equal to then tube of the calyx, with short distracted black and white hairs. Flowers 10.0 - 15.0 mm long, almost sessile. Calyx 7.0 - 10.0 mm long, bell-shaped, in beans preserved, not swell BLISTER, fiber; teeth linear styliform, shorter than the tube of the calyx. Corolla pale yellow, wherein the beans is not retained. Flag 14.0 - 16.0 mm long, elliptical rhombic on top incised. Wings 11.0 - 14.0 mm long, oblong lance, the top blunt. The keel 10.0 - 12.0 mm long. Beans (7.0) 10.0 - 15.0 (19.0) mm long, 8.0 - 9.0 mm wide, egg-shaped or nearly spherical, membranous, bulbous, densely covered with white and black hairs, in thoracic and abdominal sides striated, on top with a long curved beak, with two sockets. Seeds kidney, yellow, shiny. 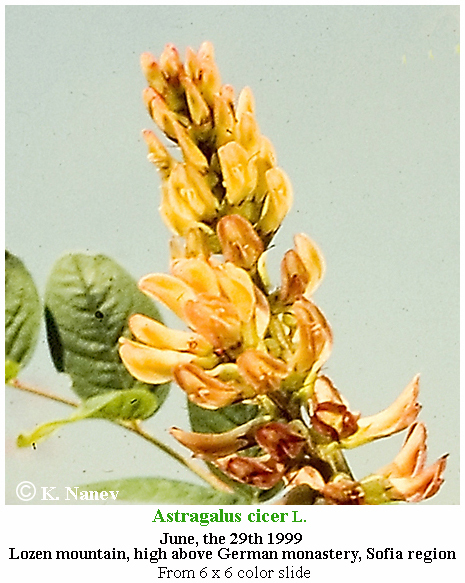 Astragalus cicer, the chickpea milkvetch, chick-pea milk-vetch or cicer milkvetch, is a perennial flowering plant native to Eastern Europe, popularized and subsequently transported to areas in Southern Europe, North America, and South America. Cicer milkvetch exhibits legume-like qualities; the plant produces pods in which harbor its seeds. Its flowers are usually of pale yellow tint (sometimes white), and as such, attract bumble or European honey bees for pollination. Growth often exceeds 0.6 meters, up to a height of 1 meter in length. 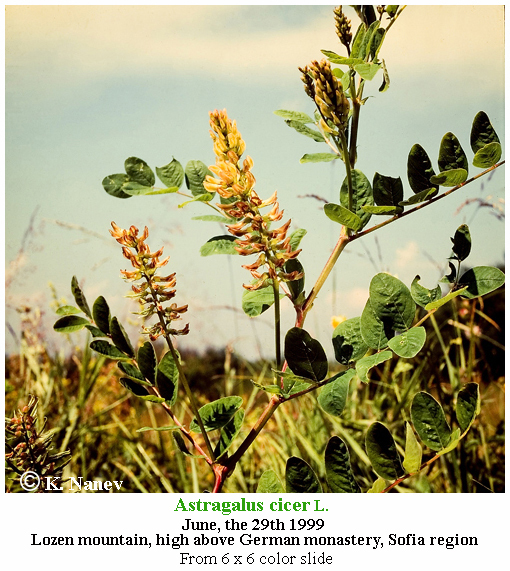 Astragalus cicer is suited best to grow in the Rocky Mountain area in the United States; however, it has been shown that cicer milkvetch also flourishes in coastal areas – and more specifically has been found to perform well in the coasts of Alaska. Because cicer milkvetch displays high tolerance to drought, it has been shown to abide in dry-land locations such as Idaho, Montana, and Wyoming – all of which are areas that often receive less than 14 inches of yearly rain. In general, cicer milkvetch can be seen to grow in the fringes of forests, meadows, and alongside streams; however, it has also been reported that the plant proliferates along roadsides. Cicer milkvetch has the capacity to grow in a vast amount soil types and textures, such as clay and sand. As such, it has been shown to proliferate in coarsely-textured soil. Excessive salt proves to be harmful to the plant. Soils deviating from the 6.0 to 8.1 pH range are also indicative of a less-than-desirable condition for growth. Despite these few restrictions, cicer milkvetch persists excellently in less nutrient-rich or disturbed soils. Although the plant grows exceptionally well in higher temperatures, it has been shown to exhibit slow-growth at temperatures as low as 7 to 18 °C. Drought tolerance is another important aspect in regards to the inherent durability of the plant. In regards to obtaining adequate amounts of nitrogen, cicer milkvetch employs a mutualistic relationship with rhizobia bacteria. Cicer milkvetch exhibits rhizomes (sometimes referred to as creeping roots), or an extended horizontal stem propagated underground, which continuously grow as the plant ages. Thus, the plant becomes increasingly vigorous with time. In regards to proliferation, cicer milkvetch spread by its utilization of rhizomatous growth, in addition to its reproduction via seeds. Seeds (produced by pods) have a very thick integument (or seed coat) in which require scarification, or mechanical methodology, to proceed towards germination. The hardy aspect of the seed coat acts as a preventative barrier against “microbial invasion.” In addition, the thickness of the seed coat reduces the capacity for water absorption, which in turn allows for the seed to remain dormant for a longer period of time. Stipules are readily observed and green in color. Leaves are compound and alternate. Flowering Time: Blooms: VI - VIII, fruitful: VIII - X. Distribution in Bulgaria: Grow in dry or wet grassy meadows and places around the outskirts of forests and bushes in field boundaries, along roads and river terraces. Circulated to 1100 altitude. (Conspectus of the Bulgarian Vascular Flora) = conspectus&gs_l= Zlc. Distribution: Central, Eastern and Southern Europe, Mediterranean (North). Siberia, Caucasus.